..that the Luxe series has come to an end, but it was a very satisfying one! On the author's blog, she hints that perhaps there will be more to come after all, and I do hope that is true. I think I could go on reading this series forever. Even if it's truly over, I will definitely look forward to whatever she writes next. 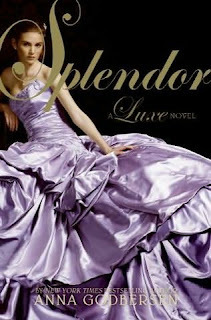 Splendor brings some of the story lines of the series to a close, but also reveals even more shocking twists and developments in the lives of the Holland sisters and others in their social set. I want you all to read this series so I won't spoil it by revealing anything of the plot. Parts of the story resolved in just the way I'd hoped they would, while other parts went a direction that surprised me. The series retained the glamorous, decadent feel all the way to the end of the last book. My fascination with constricting society isn't limited to this series, though. I've also been enjoying the audiobooks of Anne Perry's mysteries set in Victorian England, and of course I never tire of the BBC's Pride & Prejudice. There is something delicious about murder and scandal among people with such strict etiquette in times when women were treated a bit like caged exotic birds. If you know of other books with these qualities that I might have missed, please let me know what they are! I've been working on the Montmorency series. The main characters are men (no teens) but it's still really fascinating. I loved the first one. I'm on the third which is rare for me, I usually just read one or 2 of a series. Anyway they take place in Victorian London (and beyond further in the series) and there is lots of intrigue and tension and lots about the times...clothing, manners, social stuff. Also, have you ever read Philip Pullman's Sally Lockhart series? Very good... Victorian London mysteries with opium! I haven't read either the Montmorency series or the Sally Lockhart series - thanks for the suggestions!